It sounds like a kosher riddle: What comes from meat, many think its dairy but its really pareve? The answer, of course, is the egg. It may seem strange that eggs are treated as neutral even though they come from chickens. The reason, likely, is that once they’re out of the chicken they’re considered a separate entity. But why do people think, even for a moment, that eggs are dairy? There’s nothing milk about them. I first noticed the issue when I was developing recipes for my kosher cookbook. 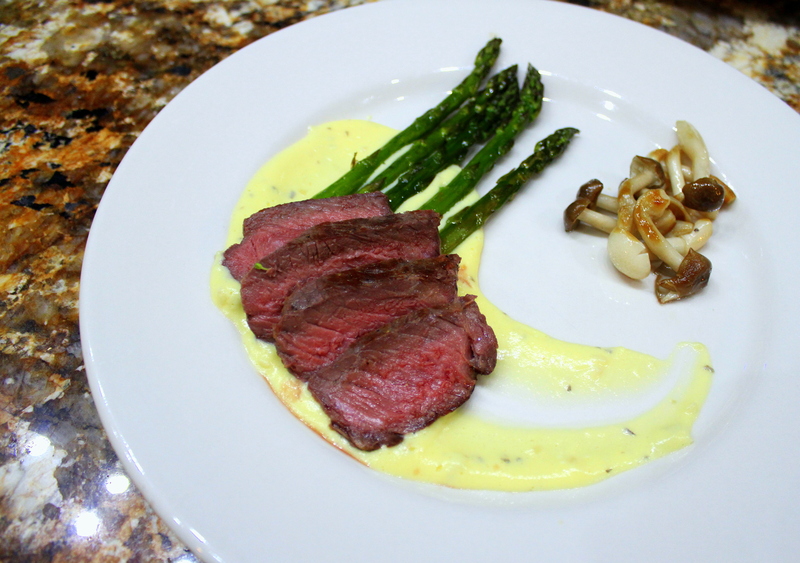 I would often ask friends to test drive those recipes, one of which was built around steak with a Béarnaise sauce. I e-mailed one of those test drivers the recipe and within five minutes received a sharp e-mail back: “How can steak with bearnaise sauce be kosher??? ?” I called her up and said “hey, I used margarine instead of butter. It’s kosher.” That got me nowhere: “right, but eggs?” I thought she was joking. She wasn’t. Perhaps it goes back to childhood breakfasts that prominently featured eggs and milk. Maybe its because they are both are commonly found in supermarket dairy aisles, often with cheese and yoghurt. Or it could be because both eggs and dairy are, essentially, animal byproducts. Regardless of the reason for the misconception, the fact is it’s a misconception. Dairy products are made from milk. Eggs are not made from milk. Thus, eggs are not dairy. 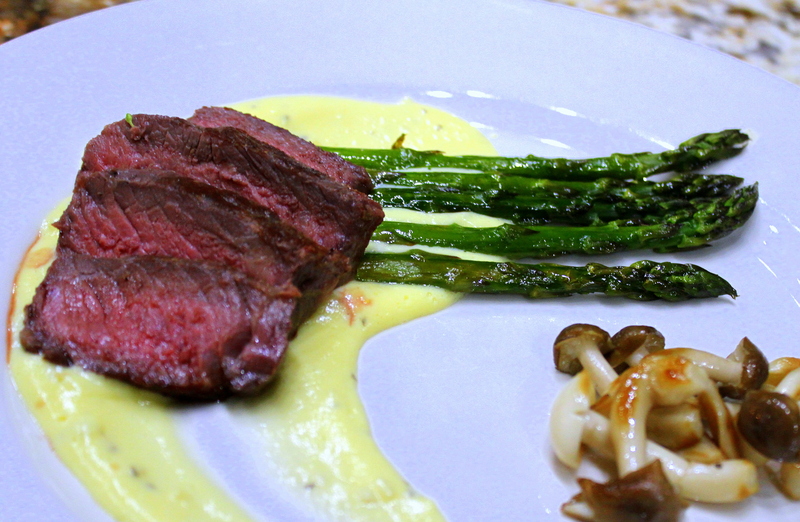 Which means that pairing steak with a Béarnaise Sauce could be perfectly kosher. My preferred method of cooking steak is sous vide. French for “under vacuum” (a bit of a misnomer), sous vide is a method of cooking in which food is sealed in airtight plastic bags and placed in a water bath at an accurately regulated temperature, lower than normally used (temperatures for beef would be between 131° and 140° Fahrenheit). The idea is to cook the item evenly, not overcook the outside and keep the inside at the same level of “doneness,” thus keeping the food juicier. For steaks, caramelization (the Maillard reaction) is achieved by a quick sear after the meat comes out of the water bath. Steak cooked sous vide and seared appears more rare inside than it actually is. It ends up all being the good stuff. But sous vide cooking requires equipment that many home cooks don’t own. No worries. The steaks for this dish can be cooked with a pan roast to excellent results. The recipe offers both options. Either way, eggs still aren’t dairy. Cook the Steaks Sous Vide. Preheat your sous vide setup (if using) to 134° Fahrenheit. Meanwhile, preheat your oven to 375° Fahrenheit for the asparagus. Pat the steaks down with a dry paper towel on both sides. Season each steak liberally with salt and pepper. Place the steaks in food grade plastic bags and vacuum seal each bag. Cook the steaks for one hour at that temperature. Make the Béarnaise Sauce Reduction. Put the vinegar, shallots, and 1 tablespoon of tarragon leaves into a small saucepan, and set over a medium flame. Bring just to a boil, and then reduce heat to a simmer until there are only a few tablespoons of liquid left, approximately 5 minutes. Remove from heat, and set aside to cool. Roast the Asparagus. Oil a hotel pan, baking sheet or a baking dish large enough to hold the asparagus in one layer. Place the asparagus in a dish, and toss with the olive oil, salt and pepper. Place in the oven and roast for 10 to 15 minutes, until the stalks begin to shrivel and color lightly. If Pan-Searing the Steaks. Place a heavy skillet – preferably cast-iron – on the stove over high heat until the pan is smoking hot. Carefully place two steaks in the pan. Sear for two to three minutes, then flip and sear for another two to three minutes. Transfer the steaks to a hotel pan in the pre-heated oven and finish in the oven. Wipe out the pan and repeat with the remaining two steaks. Make the Béarnaise Sauce. Meanwhile, bring a small saucepan with an inch or two of water over medium-high heat to boil. Put the cooled sauce reduction into a metal mixing bowl along with a tablespoon of water and the egg yolks and whisk vigorously to combine. Turn the heat under the saucepan of water down to its lowest setting, and put the bowl on top of the pan, making sure that it does not touch the water directly. Continue to whisk the yolks until they thicken, approximately 5 to 7 minutes (alternatively, use an immersion blender or do it all in a food processor). You should just about double the volume of the yolks. Finish the Béarnaise Sauce. Slowly beat in the melted margarine, a tablespoon or two at a time, whisking slowly to combine and emulsify. Remove the bowl from the pan occasionally to avoid the eggs, and taste the sauce. Season with salt. If the flavor is not sharp enough, add a splash of lemon juice. If the sauce is too thick, stir in a splash of hot water. Add the remaining teaspoon of tarragon leaves, and serve. Sear the Steaks. Meanwhile remove the steaks from the sous-vide and from their bags. Heat a heavy pan (preferably cast iron) over high flame until very hot and sear the steaks on both sides until they have nicely caramelized, about 2 minutes on each side. Rest the steaks for five minutes. Pan Sear the Beech Mushrooms. Heat the oil in a sauté pan over high heat until nearly smoking. Sauté the mushrooms for two minutes until just colored.Plate the Dish. Slice the steaks on the bias. Pour a pool of the sauce near the side of a plate. Using the back of a soup spoon, swipe from the center of the pool around the outer curve of the plate. Arrange five stalks of asparagus across the sauce on each plate, the spears pointing away from the sauce. Fan four slices of steak in an angle opposing the asparagus. Arrange the beech mushrooms attractively on the other side of the plate.